Melanie Beasley is a biological anthropologist interested in human-environment interactions throughout the hominin lineage. She arrives at UT as the Haslam Postdoctoral Fellow at the Forensic Anthropology Center after receiving her PhD from the University of California, San Diego in 2016. 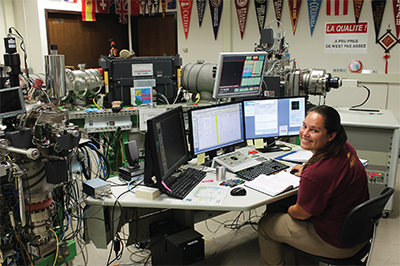 Melanie uses isotope geochemistry to investigate the role of environment in human history at different time periods. The first is the paleoenvironment when seasonal changes in resources, such as water and food, impacted our evolutionary history and selection for morphological changes – bipedalism, for example. The second is prehistoric California when humans had greater impact on the surrounding environment in terms of hunting for resources, which resulted in wider diet-breadths and possible changes in health. Finally, Melanie investigates modern forensic applications when the environment a person inhabits prior to death imprints distinct isotopic signatures in their biological tissues that can be used for identification. Melanie works with Director Dawnie Steadman, the FAC team, and the donated skeletal collection on new geochemical techniques to understand to how elements in water can act as unique tracers for use as an exclusionary tool for forensic identification. Understanding known offsets between modern environments and biological tissues of elements in water is critical to apply new geochemical techniques to the archaeological and fossil record, specifically to refine the definition of “mosaic” environments early hominins occupied.